Discussion in 'other anti-virus software' started by AshG, Jul 18, 2008. I am trying (again) Avira Premium on my main system. I did some major scrubbing and hand-removed every possible remnant, file and registry, of any antivirus or antimalware software that has ever been installed. I am still running headfirst into some problems that others are experiencing, but that Avira's forums have not been able to tackle for anyone. The other two computers I have trialed Avira on have been so problem-free that I am about to put down some coin for three licenses, but If it doesn't work on my desktop then it's back to the drawing board for all three systems. Webguard and Mailguard refuse to start under any circumstance. Windows Defender was disabled before, during, and after installation. No other antivirus or antimalware program was installed. In Services.msc, the error prompt tells me that Webguard started, then stopped unexpectedly. It says Mailguard won't even begin to start. 7/18/2008,12:41:53 Keyfile contains a valid license. The Avira AntiVir Premium will run as a fully functional version! 7/18/2008,12:41:54 AntiVir Guard was enabled. 7/18/2008,12:41:54 Avira AntiVir Premium has been started successfully! 7/18/2008,12:49:06 Avira AntiVir Premium service has been stopped! 7/18/2008,12:50:11 Keyfile contains a valid license. The Avira AntiVir Premium will run as a fully functional version! 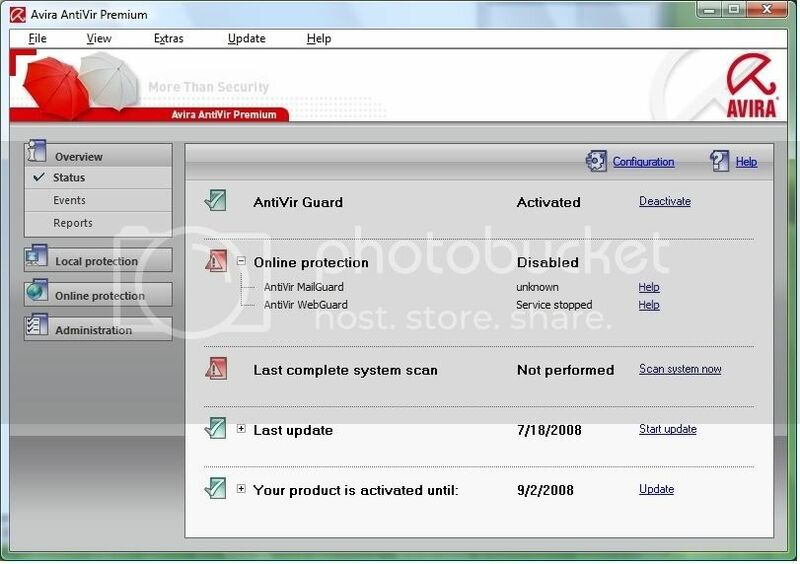 7/18/2008,12:50:12 AntiVir Guard was enabled. 7/18/2008,12:50:12 Avira AntiVir Premium has been started successfully! 7/18/2008,12:41:58  [ERROR] Avira AntiVir Premium  engine service is not running. 7/18/2008,12:41:58  [ERROR] Unable to initialize Avira AntiVir Premium  Engine. 7/18/2008,12:42:04  [INFO] The Avira AntiVir Premium Mail Service has been stopped. 7/18/2008,12:50:50  [ERROR] Avira AntiVir Premium  engine service is not running. 7/18/2008,12:50:50  [ERROR] Unable to initialize Avira AntiVir Premium  Engine. 7/18/2008,12:50:56  [INFO] The Avira AntiVir Premium Mail Service has been stopped. 7/18/2008,12:40:48 [INFO] The service was stopped. 7/18/2008,12:42:25 [INFO] The service was stopped. 7/18/2008,12:50:10 [INFO] The service was stopped. I'm hoping I can get some help here; as I said, the other poor sots facing this problem got nowhere. We're all using Vista 64 Ultimate too, according to the threads. Something is up. I will forward this info so we can hopefully reproduce the problem and fix it. Thanks for your reply. One of the mods at the Avira forum dropped in to help and we may have found another piece of the puzzle. There is a log file that is supposed to exist, but doesn't. I cannot find the avesvc.log file anywhere in my computer. I have a folder full of other log files, just not this one. Just in case, may I suggest you to try the jv16PT's RegistryCleaner feature? (30day trial without limitations, works with vista x64 systems). Please uninstall avira, run the RegCleaner and fix all errors found, then restart and reinstall avira. As for the 'avesvc.log', on x32 it is located inside the 'C:\ProgramData\Avira\AntiVir PersonalEdition Premium\LOGFILES' directory by default. Thanks for the suggestions, Macstorm. I prepped the system with jv16 before installing Avira; I even used its Finder service to locate any trace of Eset, F-Prot, and Vipre. For all intents and purposes, she was antivirus pure by the time I finished. 7/18/2008,16:13 [INFO]  Setup is running in update mode. 7/18/2008,16:13 [INFO]  Commandline: "C:\Program Files (x86)\Avira\AntiVir PersonalEdition Premium\SETUP.EXE"
7/18/2008,16:14 [INFO]  Due to a change of the module 'Driver' a restart is necessary. 7/18/2008,16:14 [INFO]  Setup has successfully changed and updated your configuration. Before you can use the program, you should restart your computer. Do you want to restart your computer now? -  Yes button was selected. I don't use Avira. But you can try this press the windows button together with r now type devmgmt.msc press enter. Go to the view menu select show hidden devices. Expand the section non plug and play compatible drivers. Now let somebody elso who also uses Avira check the entries and let them double click on them to see the status which you can find once you press on the driver tab. If the settings are different change them on your computer. You may not find an yellow exclamation mark or a red cross. That is how you can verify if the all components are there to run the modules were you have issues with. Sorry to hear it didn't work for you. Have you tried a clean install of avira premium with its latest installer? From your setup logfile i see your installation was 'running in update mode'? Please consider Niels's advice above. Yeah, from what I've heard there's some major stuff missing from my log file. I'll try to find a newer copy to download from somewhere; it seems as if the major updates have hit the autoupdate, but I can't find a similarly updated .exe to download. I've attached the non-PnP driver list, as requested. Stephan, I think I may have vexed your team. I am extremely appreciative of Avira's forum helpers but I think we've hit a wall with this problem. As soon as I am done with my thesis work, I will back up my desktop, do a format/reinstall (I can't image with my Intel RAID for some reason... ), and make sure Avira is the first thing I put on the system. if that works, then I'll try to see what kept it from working the first time.